As a second honeymoon, my wife and I took a trip to the island of Oahu in Hawaii. Considering that it was January, we wanted to go somewhere warm, but that was also a completely different experience for us. After much evaluation we settled on the farthest U.S. state from the Northeast. Neither of us had ever been there, so in addition to offering up some warmth in the winter, we got to experience something new. 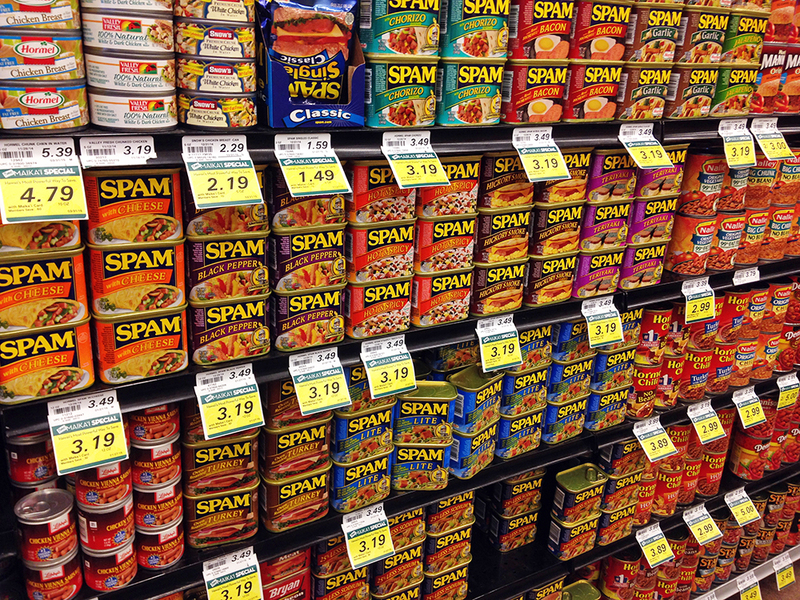 I didn’t know much about Hawaii other than what I saw on TV such as leis, luaus, ukuleles, the fact that the islands are stunning (I still wasn’t prepared for the beauty of the place), and that there is a local love of all things Spam. Before even leaving for Hawaii, I quickly started doing my research into the restaurants. A few hours later and many revisions during the trip, I created an online map of every place I wanted to try that spanned across the entire island. Despite my lofty goals and a rental car with great gas mileage, my wife and I could not physically try every single place due to time, but more importantly, stomach capacity. Nonetheless, we did our best and this post includes the best of the best of what we ate in Hawaii. Surprisingly enough, almost everyone we knew told us that everything in Hawaii is crazy expensive (and some things are definitely unreasonable), but the vast majority of the restaurants included here provided amazing meals at reasonable prices. Note: Awesome musubi. It will ruin musubi for you anywhere else. It’s that good. Note: Good, solid breakfast in a typical American / Australian style. Note: Not the best breakfast, but it’s so cheap and fast, that it can be worth it for a quick bite. Note: Best coffee we had in Hawaii. Strong coffee balanced with sweetness and you must try it with boba (tapioca pearls). Note: My friend (a local) recommended this place to us for our first experience with Hawaiian Food. It was fantastic. A must visit. Note: I discovered this restaurant from famous food shows, but they couldn’t capture how wonderful the food turned out. Another must visit. Note: It’s a truck, but it’s permanently parked. There is covered seating, a simple menu, and a sink to wash up after. The food was really good, but be ready for an incredible amount of garlic if you try the scampi. Note: Vietnamese fusion food that delivers on traditional flavors with a twist. Note: A truly unique dining experience where the owner asks you questions about your favorite Thai foods and then creates a custom meal for you. If you’re adventurous enough to trust someone else to order for you, then you’ll have a great time here! Note: The sushi is so good and so ridiculously affordable that I’m still having trouble wrapping my mind around this place. Cheap, delicious, filling, and features a conveyor belt. What more could you want? Eat what you like, but you absolutely must get the mini-mix don ahi tuna bowl. Note: My friend who lives in Hawaii met up with us and took us to this restaurant. The Asian-inspired dishes really captured the best qualities of Korean cuisine. The Li Hing Margarita is a uniquely Hawaiian flavor with a sweet and tangy quality. Note: We enjoyed Bills, but it wasn’t our favorite place to eat overall. 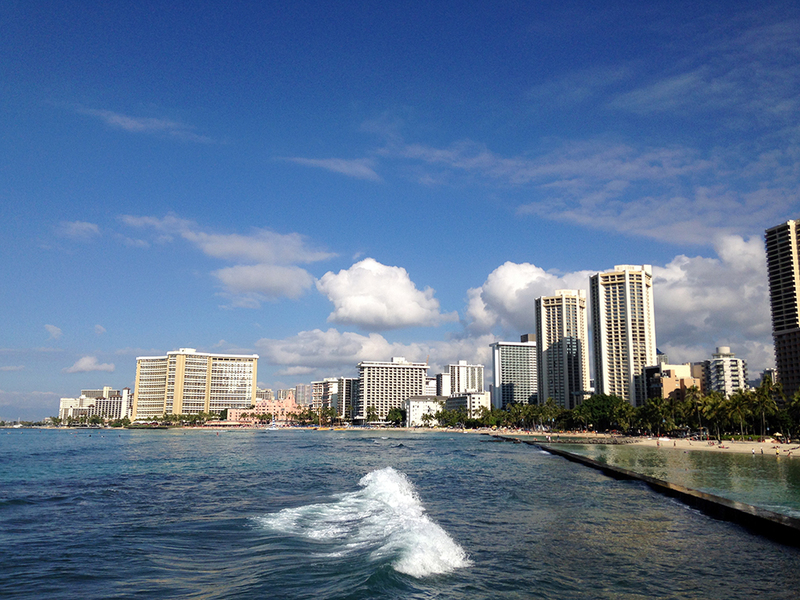 Nonetheless, it was a great find for quality and somewhat affordable dining in the tourist infested Waikiki Beach area. Note: After almost a week of trying different foods, my Greek wife wanted to go back to her roots and try this Greek restaurant out. The food was very well done and the flavors were excellent. The food quantity isn’t much considering the price and ordering for dining in is a bit of a disaster, but overall a good experience. Note: If you can get to the North Shore then make sure to make a stop here for a sweet snack. Decadent pudding-style pies and fantastic pastries. Note: Good luck finding parking here because Leonard’s is always jammed full of people. The soft doughnut-like malasadas are that good. I recommend Haupia filled and the sugar with cinnamon flavors. Note: At first glance, these cookies don’t look like they are anything special, but the truth is that they taste ridiculously good. The best part is that in all of the many store locations, there are free samples! Note: An insider tip from my friend who lives on the island showed us the late night treasures that await in Napoleon’s fast food style bakery in Zippy’s. Note: This is the BEST shave ice on the island. Seriously. Not an exaggeration. It’s a little out of the way and in a strip mall, but you must go here to try the natural homemade syrups over the most delicate shave ice ever. Keep an eye out for Uncle Clay himself. He’s so personable that he chatted with my wife and I for 20 minutes as well as gave us each no less than three hugs before we left. Note: Amazing shave ice on the North Shore in one of our favorite towns, Haleiwa. Second only to Uncle Clay’s, Matsumoto delivers tons of flavor options and a more traditional style of shave ice in a cone. Note: My friend called this farmers’ market “a must experience” and he was right. I wanna go there. It facinates me that they are still so effing into spam and I’ve really got to experience that first hand. Thanks for checking it out! I know you’re in (or were in) Vietnam, so I hope I’ll get to read something about your trip! The Instagram photos have been ridiculoooouuuuus! Yeah, well… The human stomach has limits to what it can hold in an 8 day period. Next time for sure though.